The ghostly shells of galaxy ESO 381-12 are captured here in a new image from the NASA/ESA Hubble Space Telescope, set against a backdrop of distant galaxies. The strikingly uneven structure and the clusters of stars that orbit around the galaxy suggest that ESO 381-12 may have been part of a dramatic collision sometime in its relatively recent past. 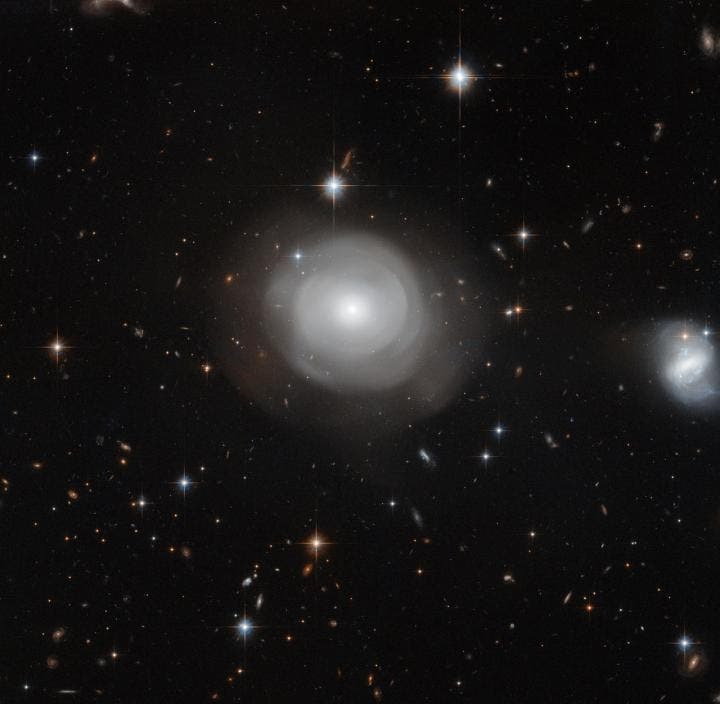 Located roughly 270 million light-years from Earth in the constellation of Centaurus (The Centaur), a bright constellation in the southern sky, ESO 381-12, also known as PGC 42871, is categorised as a lenticular galaxy – a hybrid galaxy type that shares properties with both spiral galaxies and elliptical galaxies. The delicate shells that bloom outwards from ESO 381-12 are very rarely found around this type of galaxy and their cause is a bit of a cosmic mystery. It is thought that PGC 42871 may have recently interacted with another galaxy, sending shock waves through its structure much like ripples in a pond. These galactic mergers are violent processes, smashing together material within the clashing galaxies and completely changing how they look and how they will evolve in the future. This violent event likely triggered a wave of star formation throughout the galaxy, leading to the creation of many hot young stars. Astronomers have studied ESO 381-12 in detail because of its very unusual structure. It was one of a sample of galaxies explored by Hubble's Advanced Camera for Surveys during a recent study of the properties of shell galaxies created in merger events a billion or so years ago. The prominent galaxy at the right of the frame, known as ESO 381-13 or PGC 42877, is a different beast altogether and both active star formation and dust can be seen within it. However, ESO 381-13 and the shell galaxy are at very similar distances from Earth and, despite their differences, may well be interacting.